What happens when a public-health researcher deep in coal country argues that mountaintop mining endangers the entire community? Hint: it doesn’t go very well. Many of you have already subscribed to our other podcast, Tell Me Something I Don’t Know – and if you haven’t, now’s a good time to do it, since our new season starts February 19th. We’ll be putting out 30 episodes this year – so if you subscribe – on iTunes, Stitcher, or wherever you get your podcasts — you won’t miss a one. And: come see us live! In March, we’ll be in Washington, D.C., Boston, and New York. In April we’ll be in Chicago. Even better, sign up to be a contestant when we’re in your town. Big thanks to our producing partners WAMU in D.C., WBUR in Boston, and WBEZ in Chicago. And remember: new episodes of Tell Me Something I Don’t Know will start coming your way on Sunday, February 19th. You wouldn’t think it’s a good time to make a bet on coal. As recently as the early 2000s, more than half of the electricity in the U.S. came from burning coal; now it’s only a third. One big reason is competition from cheap natural gas. But also coal, due to its environmental costs, has become heavily regulated over the past couple decades. And yet: coal is suddenly having a bit of a renaissance. A recovery in the price of coal has a number of mining firms looking to go public. The election of President Trump also helped; he called for a revival of the industry, and he criticized President Obama’s “War on Coal.” Indeed, just a couple weeks into his administration, Congress reversed a coal-mining regulation that Obama pushed through in his final days, and Trump is expected to sign it. John FLEMING: You should be embarrassed to be here with a study like this! I’d like you to meet Michael Hendryx. Michael HENDRYX: I’m a professor in the Department of Applied Health Science in the School of Public Health at Indiana University. Stephen J. DUBNER: And Applied Health Science means that you, your discipline and your PhD. and so on, are in what? HENDRYX: My PhD is originally in psychology. I’ve had a long route to where I am now. I was trained originally in research methods and research design, but for much of my career I applied that to other kinds of health services problems. It was only fairly recently that I started to get interested in environmental issues and in the health problems that the people in the mining communities were experiencing. Fairly recently being around 2006, when Hendryx landed a job at West Virginia University, in the heart of coal country. He’d come from Washington State University, in Pullman, Washington – wheat country. His research there was focused on mental-health services. HENDRYX: When I first decided to take the job, I didn’t really have any plans to pursue research interests related to coal. It was something that came about after I moved there. Hendryx immediately found that West Virginia was different from Washington state in many ways – culturally, politically, and of course geologically. Crystal GOOD: My name is Crystal Good and I am a poet, an advocate, and entrepreneur. Tammy NICHOLS: My name is Tammy. I’m 50 and I am from Summersville, West Virginia. GOOD: Coal is a part of the fabric of West Virginia. It doesn’t matter if you’re directly in the mines, there’s an ancillary business that we all benefit from or are connected to. NICHOLS: This is a rich state, okay? And there is things out there in the mountains and everything that could really make money and jobs for people. GOOD: Whether that’s my mom unloading a coal truck at DuPont or whether that’s my basketball team being sponsored by Friends of Coal or, you know, however. Everybody’s in some way connected to the industry. That connection extended to Hendryx’s new university. HENDRYX: West Virginia University would have their annual Coal Bowl football game, the game between West Virginia and Marshall every year, just as one example. And they had a research center for coal and energy on the WVU campus. Politicians were always quick to support and defend the coal industry if they wanted to get reelected. Very pro-coal environment there. DUBNER: And it sounds like you were at least a bit of an environmentalist when you came to West Virginia. HENDRYX: Well, I loved the outdoors. I learned how to fly-fish and hiking and backpacking and such, yeah. That’s true. DUBNER: Which is not to align you with any political movement, because we know there are naturalists and environmentalists across all political spectrums. But I am curious what your views were on coal, per se, coming into WVU. HENDRYX: You know, I really knew almost nothing about it. I was one of those people that didn’t know how the lights were turned on or what the energy sources were. I was educating myself at about that time. I happened to come across a book, it was written by a journalist, Jeff Goodell, called Big Coal. And he was doing stories about the important and kind of quiet role that coal played in American life, and he was describing some of the stories of people that lived in these mining communities. And that’s what got me, kind of the first knowledge I had about this as a potential issue. DUBNER: And then that led you to think, “Hey, I should take a look at public health implications of coal mining”? Was it as direct a line as that? HENDRYX: Yeah. It’s as simple as that. It seemed like a logical next step. Now, we should back up here and say that coal mining had changed a great deal in the past few decades. As we noted earlier, the industry has been in serious decline, with production falling substantially and, with it, employment. Especially in a place like West Virginia. The Bureau of Labor Statistics, which groups together mining and logging jobs, shows that sector has fallen roughly 40 percent in West Virginia in just the last five years. Again, there are several reasons for this decline – especially the natural-gas juggernaut – but it’s also related to something that happened decades earlier, in Washington, D.C.
President George H.W. BUSH: Thank you all very much. Thank you. In 1989, at the White House, President George H.W. Bush made a major announcement. PRESIDENT BUSH: First I’d like to lay on the table my proposals to curb acid rain and cut urban smog and clean up air toxics. And second, I want to call upon all of you to join me in an acting into law a new Clean Air Act this year. Michael HENDRYX: The Clean Air Act, it has been successful at reducing acid rain pretty significantly and at improving air quality from power plants. There’s no question about that. But there was an unintended consequence of the new Clean Air Act. HENDRYX: Economically, it became more attractive to try to mine coal that before maybe wasn’t attractive to mine. This type of coal had lower levels of sulfur. And it was especially plentiful in the mountains of central Appalachia. To get it, miners turned to a process known as mountaintop coal removal. 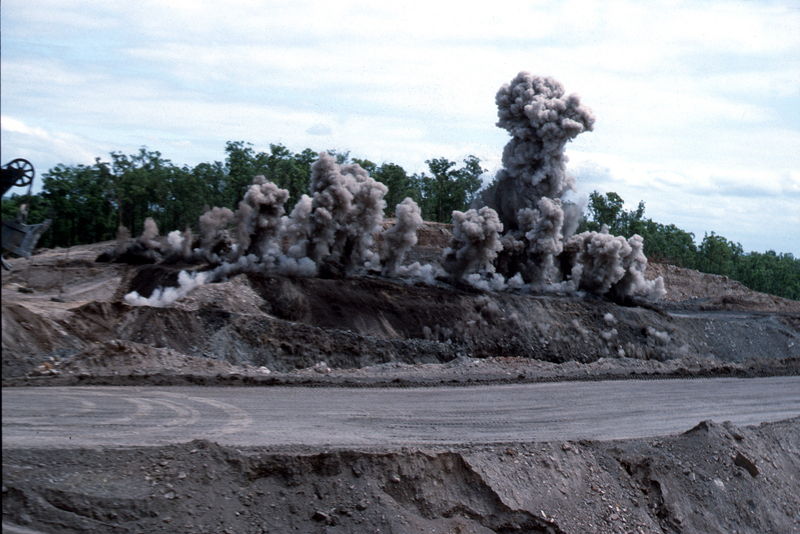 Rather than burrowing deep beneath the ground for seams of coal, mountaintop removal is a technique that involves literally blowing up mountains. The health hazards of underground mining – both immediate and long-term – are substantial and well-established. But what about the health hazards of mountaintop removal? HENDRYX: People that work in surface mining — even though there’s some evidence that they may suffer some respiratory issues over time as well — the evidence is that that’s less dangerous than underground mining. Statistics from the West Virginia Office of Miners’ Health, Safety, and Training show that surface mining is indeed much less dangerous than underground mining. At least for the miners. But what about everyone else — the people living near the mountains that were being blown up? For Michael Hendryx, a public-health researcher, that seemed a natural question to ask when he arrived in West Virginia. DUBNER: So at the time mountaintop removal mining was viewed as how in terms of environmental impact, and let’s say, public health impact? HENDRYX: I think there was always concern about its environmental impacts. I mean, you’re using explosives to literally blow hundreds of feet off the mountaintops around where people live. There’s large-scale deforestation of existing forests in these areas. There’s permanent valley fills that permanently buried several thousand miles of streams in this region.You would hear stories from residents about the health concerns that they had, but nobody seemed to be investigating the public-health impacts of this form of mining until we started this line about ten years ago. Hendryx began by reading the literature on the effects of open-mining sites and he was surprised to find there wasn’t much. Hendryx began with mortality data from the Centers for Disease Control. It was specific enough that he could identify causes of death at the county level, and for specific population groups. HENDRYX: So we would merge those data with other data. So we used, as a key source, information from the Department of Energy on the amount of coal that was mined in different counties. And we could merge these together, along with other kinds of demographic and behavioral risks, to try to understand whether people who lived in areas with heavier mining had higher mortality rates. To find an answer, there was a fair amount of statistical maneuvering to be done. HENDRYX: The people in these communities, as a general statement, tend to have lower levels of income, they tend to sometimes engage in less-healthy behaviors, smoking rates are higher. So we had to try to account for those somehow. But there are very well-established statistical approaches to be able to do that. So as we looked at it more and more, the evidence became, in our view, stronger, that there really was an independent association of being in mining communities that was related to a variety of poorer health outcomes. And it was an effect that was most pronounced in areas where surface mining takes place, especially mountaintop removal mining. And the health effects were present for men and for women, and for some children’s outcomes, which made us think that it’s more of a community-wide issue and not just an occupational exposure issue. DUBNER: And talk me through, for a moment, the mechanics by which you believe mountaintop removal, and perhaps other coal mining, actually increases mortality, and the specific ways, I guess, in which it has an ill effect on the health of, as you described it, men, women, children, and I guess in-utero children as well. HENDRYX: Sure. When we first started doing these studies, we did not have direct measures of environmental conditions. We only had these correlational studies that showed poorer health outcomes in these communities in ways that were not explained by other measures. So that was a limitation of the earlier studies. And more recently, we have been going out and collecting environmental data from communities where mining occurs, as well as control communities where it does not. We found evidence for a variety of environmental problems in these communities. HENDRYX: For example, levels of silica, crystalline silica, which we think are coming from removing the rock and soil to reach the coal, which is done through the use of heavy machinery and through explosives, raises dust levels in these communities, and silica levels in particular are known to be a toxicant to lung tissue. They’re known to be a contributing factor to lung cancer, and that’s one of the most consistent health problems that we’ve seen in these communities. We’ve also seen evidence for elevations in some organic compounds in air samples. Polycyclic aromatic hydrocarbons, which are coming in part from, again, from the coal itself and from the rock and soil around the coal, we think, as well as potentially from some of the diesel products that are used in the machinery and in the explosives. So we think the air is a transport route for the health problems that exist. We’ve also measured the particle size in these communities, and we found, somewhat to our own surprise, that the most pronounced difference, when you compare mining communities to similar rural communities in West Virginia that don’t have mining, the primary difference is in very small particles that are called ultrafines that can penetrate deeply into lung tissue, that are known to be a particular health hazard, and those were the particle sizes that were the most pronounced. We’ve done some limited water quality testing, and we find some evidence, as well, for some coal-related contaminants in some groundwater samples. Higher levels of conductivity in water—we don’t know exactly what’s causing that, but there’s evidence for some water impairments, too, that are related to the chemicals that are used in the coal extraction and processing activities. HENDRYX:We’re convinced that surface mining in central Appalachia, especially mountaintop removal mining, is an independent significant risk to public health. HENDRYX: The principal unintended consequence of the Clean Air Act was to encourage the development of mountaintop removal coal mining in Appalachia, and there is strong evidence that this form of mining is harmful. It’s harmful not only to public health, but it’s harmful environmentally, and the people who live in these communities have had to suffer so that others can enjoy cleaner air. Coming up on Freakonomics Radio: Professor Hendryx goes to Washington — which doesn’t go quite as planned. HENDRYX: Well, to tell you the truth, I was pretty naïve. The public-health researcher Michael Hendryx had discovered an unfortunate chain reaction: the Clean Air Act amendments of 1990 did clean up the air, substantially, but they also incentivized a boom in mountaintop coal mining — which, his research showed, led to widespread public-health hazards. Not just for the people involved in mining, but for anyone living nearby. The fact is, almost any regulation or piece of legislation will have some unintended consequences. Environmental regulations seems particularly susceptible. About a decade ago, the United Nations began offer a generous bounty to manufacturers for destroying their stockpiles of a pollutant – HFC-23 – that is a byproduct in the manufacture of a common refrigerant. The U.N. was hoping the manufacturers would be grateful enough to collect their money from the stockpiles and switch to making a different refrigerant. Instead, factories in China and India doubled down, making even more of that refrigerant in order to create even more of the byproduct and get more of the money the U.N. was handing out. Or consider the Endangered Species Act. It is meant, of course, to protect species under threat – but there’s a good possibility, as one environmental economist puts it, “that the Endangered Species Act is actually endangering, rather than protecting, species.” Why? Because a species is often declared endangered months or even years before its “critical habitats” are officially designated. This allows time for public hearings – and it also allows time for developers and foresters to rush in and pave over those critical habitats before it’s illegal to do so. So perhaps we shouldn’t be too surprised that a law meant to clean up the air from coal pollution … has led to a different kind of coal pollution. That said, what should be done about it? Based on his research, Michael Hendryx went on record saying the appropriate policy would be a ban on mountaintop coal removal. Some people we spoke with in West Virginia supported this idea. Casey LITZ: My name is Casey Litz and I am the singer of The Company Stores. LITZ: Living in West Virginia this is an issue that is brought up all the time. You know, it pollutes our waters, it’s killing our mountains. We have a lot of other ways that we can create electricity, It should absolutely be banned. But that view is hardly universal. Brennan ZERBE: Brennan Zerbe. I’m 26. On the one hand, as like an everyday citizen living here I can say I at least dislike mining because it has a negative impact on my own life. But on the other hand I can’t speak to the need that some people have to work. The need for miners to make a living. And I can’t, you know, in total equanimity say that it should be totally banned. HENDRYX: Well, to tell you the truth, I was pretty naïve when I first started. HENDRYX: I was coming from this position of being a rational, objective person, and in my naiveté, just moving to West Virginia, not yet really understanding the nature of coal in the state or the political pressures that it could play, I thought people would listen to me and make appropriate responses to the information, and I was quickly relieved of that idea when the first results started coming out and the first efforts from the industry and the politicians were more or less to ignore it, pretend they had never read it, not want to talk about it. I thought people would listen to these results, and maybe the politicians would even listen, and maybe something could be done, and that was obviously not the case. In recent years, we’ve learned how different industries – tobacco and sugar, for instance – essentially co-opted academic researchers to produce results favorable to their industries. But here was Michael Hendryx, a newcomer to coal country, putting out academic research that made the coal industry look bad – and complicated his relationship with his university. HENDRYX: And I know that even though West Virginia University, to their credit, never pressured me to stop directly, I think that some of the upper-level administrators probably received some pressure to try to make me stop, but that was never an issue for me. I was always allowed to do the work that I felt I wanted to do. Which didn’t mean it wasn’t tricky. HENDRYX: It would be much easier for me to simply not talk about it and do something else. Because I have felt under considerable pressure to be very careful about what I would say to journalists, and be very cautious about what we would right in the papers. DUBNER: When you say you feel the pressure, what do you mean by that? You felt it how and from whom? HENDRYX: It was self-imposed, maybe, more than anything, but I knew that my department chair and upper-level administrators at the university were nervous about this work. They wanted me to be really careful. Whenever I would have an interview with a journalist, I would have someone from the media office, if it was an in-person interview, by my side, to listen to what was being said. My chair would caution me on a regular basis to be careful, be careful and I would always try to do that, because I knew that it was — after I had gotten over my naiveté — I knew that it was a really charged issue and that I was threatening a vested interest, and so I felt that. I felt the stress from it. One tool that industry groups use to challenge academic work they find unflattering is a Freedom of Information Act, or FOIA, request. In the academic community, Hendryx came to be cited as a prime example of how FOIA can facilitate harrassment. HENDRYX: We were subject to two very large FOIA requests. And the attorneys for the industry wanted essentially every scrap of paper that existed, every email that went back and forth, every draft of a manuscript, computer codes for the analyses, everything. And the attorneys for West Virginia University, to their credit, fought it as a way to protect academic freedom, and the case was ultimately heard at the West Virginia Supreme Court, and decided in favor of the university, that it was a request from the industry that was designed basically to intimidate, to freeze academic freedom, and to require me, essentially, just to waste a lot of time chasing down documents that they really didn’t need to see. And then there was the time Hendryx was called to testify before Congress about his research. Under consideration was a proposal concerning mining permits and water-quality protection. REP. DOUG LAMBORN: The Subcommittee on Energy and Mineral Resources will come to order. DUBNER: Can you talk about that experience? DUBNER: Or would you rather not? HENDRYX: It’s all right. It wasn’t the most rewarding experience, ultimately, but I was one of four witnesses who was asked to testify before a committee for Congress—a committee, of course, controlled by the Republican majority. The other three speakers were supportive of the coal industry. Hal QUINN: I’m Hal Quinn, the president and CEO of the National Mining Association. The Coal Industry strongly supports HR 1644. HENDRYX: So I was the lone voice there, and I felt like the quality of the discussion was pretty infantile. Rep. John FLEMING: So I would have to say to you, sir, I’ve seen fifth-grade science projects that were more scientific than this. HENDRYX: You know, I came here not to be insulted. FLEMING: I’m sorry, sir, but I have the time. The time is mine. And I’m sorry, but you’re–I didn’t ask you that question. HENDRYX: It can be pretty stressful sometimes. FLEMING: You should be embarrassed to be here with a study like this! DUBNER: Did you know pretty much what you were being set up to do? HENDRYX: No; again, I’m just naïve, I guess. I thought there would be a dignified discussion and I would have a chance to present my views, and others would present theirs, and I didn’t realize that it would turn into this little, insulting little exchange. HENDRYX: Is that a question? FLEMING: –and, I’m not asking you a question, sir. I’m making a statement. DUBNER: I know that Representative John Fleming of Louisiana basically treated you as if you were defending your dissertation on how to conduct statistical analysis of public health records. FLEMING: You control for those? How do you control for that? HENDRYX: It’s a common statistical analysis to control for other risk factors. FLEMING: So you use statistical analysis to control for the difference? HENDRYX: Yeah, he clearly knows nothing about analysis himself. He just had some predetermined question or two that one of his aides wrote for him, probably, that he flung out at me. We’ve published, like, 30 papers on the health problems related to this form of mining, and he chose one of them. One of our health surveys that was a published paper, maybe not one of our strongest efforts, but a published paper that documented the health problems in mining communities, and chose to take a couple of potshots at that one paper, as though that was going to make some grander statement about the weight of the evidence as a whole. But he knows nothing about research. He doesn’t even seem to understand basic control issues of how you measure covariates. He knows nothing. DUBNER: I understand he objected to your reliance on self-reported data, said your sample size was too small. Let’s pretend for a moment that he’s on the other line, and how would you just explain how your research actually stands on its own? HENDRYX: Well, the sample size for that study was several hundred people. It wasn’t too small. If it had been too small, we maybe would not have been able to find the differences that we had seen. The fact is, we did find big differences in health status across a variety of dimensions, and the sample size was certainly adequate enough to detect those. Self-report is one valid, well-recognized form for collecting health data. There’s plenty of evidence that people are, in fact, able to report their own health status accurately. I’m certainly not the only one who does analyses or writes papers based on self-reported health data. DUBNER: Let’s say, however, I put you in the prosecution chair for a moment and ask you to pick apart the overall thrust of your own argument here, having to do with the relationship between mountaintop removal mining and health of the community. Talk about what you feel are the potential flaws, weaknesses, or unanswerable, let’s say, questions in your thesis. HENDRYX: So we haven’t been able to make that direct connection within a single study between the health conditions that people have and the environmental conditions that those same people are exposed to. And that’s a limitation, there’s no question about it. We’re trying to do some work now to overcome that. But if you look at the pattern as a whole, and you see 30 papers—more than that now—and they document that the health problems are present throughout these communities. They become stronger as the levels of mining go up, they become stronger as mountaintop removal specifically occurs, they become stronger as people live closer to the sites. They are not due to other conventional confounds like smoking, obesity, education, age, insurance, et cetera. And, independently, we’ve been able to assess that the water quality is in fact impaired, that the air quality is in fact impaired in ways that are consistent with the health problems that we’re seeing in these communities. Even though we don’t have the smoking gun, you know, we don’t have the magic bullet that explains this relationship: at this point in time, with the weight of the evidence, to try to make a statement that we really don’t know, we really can’t be sure, has come to the point in my view that it’s immoral. And we have something in environmental science called the precautionary principle, that if you know there are health problems in communities, and you know that the environmental conditions are impaired, even if you don’t understand all the causal mechanisms, you have to take appropriate steps to reduce harm, and that’s what we should be doing. The Congressman who grilled Hendryx in Washington – Louisiana Representative John Fleming – recently left Congress. We reached out for a response to Hendryx’s characterization of him as someone who “clearly knows nothing” about this type of research. Fleming objected. He told us that in addition to serving as a Congressman, quote, “I am also a board-certified family physician who has studied medical literature for many years. As a trained physician, I can easily identify a well-designed or a poorly-designed study when I see one.” Furthermore, Fleming argued that Hendryx was in league with what he called “tree-hugging” environmentalists. “In short,” he said, “Dr. Hendryx attempted to push a personal environmental agenda in the guise of a public health study. That was plain to see as a physician. The conclusions about his ‘study’ were drawn by me, not my staff.” In any case, Hendryx’s testimony, and his research, have not accomplished what he hoped for. HENDRYX: Well, I wish I could say it had had more impacts. Mountaintop removal is still taking place. Hendryx says his research did gain some traction during the Obama presidency: the EPA tightened permitting guidelines for mountaintop removal; West Virginia politicians acknowledged the potential for public-health problems; and, Hendryx says, his message may have helped persuade some big-name investment banks to divest from mountaintop mining. But under a Trump Administration that has vowed to be pro-coal, momentum is already shifting. A late-Obama-era Interior Department ruling, intended to protect waterways from coal debris, appears headed for repeal. Hendryx called this “a very bad idea, in my view.” Still, he’s hoping that research like his will convince policymakers to take a more comprehensive view of environmental legislation generally. HENDRYX: Try to pay attention — not just when it comes to mountaintop removal. But to any energy policy that we develop — pay attention to the full production cycle: to where it comes from, to how it’s produced, to how it’s extracted, to how it’s used, to how the wastes are disposed of. And not just to the consumption portion. We don’t do a very good job of that, and we should do that regardless of the energy source that we’re using. DUBNER: But what do you do if your bread is buttered by, you know, the industry and maybe you see the potential downside of your activity and maybe you don’t, but people really dig their heels in and find a way to justify or confirm their position based on, you know, how they put food on their family’s table, or how they pay back their shareholders, and so on. That’s always going to be the case. There’s always going to be some industry or institution that, even if the evidence is not in their favor, they’ll make a strong argument and often win because they have a lot of leverage. So is there anything you’ve learned from your interactions on this issue that you could see would be a useful mechanism to kind of breaking that logjam to where we could perhaps align incentives more productively for the greater good? HENDRYX: Well, you’re absolutely right that people’s self-interest trumps many other considerations, and finding ways to make that work in our favor rather than trying to struggle against it is probably a smart approach. Better incentives to promote clean energy development, for example, would be one thing that I would think would be a good idea, but how do you do that when you have to face the same entrenched political interests that tend to oppose those kinds of changes? We could talk about it in a rational way, but it’s still going to require — I hate to say this, but I think it may require a crisis before we’ll make real change. DUBNER: But whenever there’s any change there are always winners and there are losers. So in this case, you know, what if the potential loser were somehow given a winning ticket? What if you could go to the coal industry, let’s say, and then say, “We are going to subsidize your clean-energy development to the tune of X, which is we’re giving everyone, plus 10%.” It’s going to be really hard for you to lose money for the next five years. Would something like that work? HENDRYX: I don’t want to — this is going to sound like I’m trying to claim your idea, but that was something I’ve actually been thinking about, a while back, is that rather than having the West Virginia Coal Association, we should have the West Virginia Energy Association, and there should be incentives for them to develop a more sustainable long-term approach to the energy needs of West Virginia and of the country. So those sorts of incentives, I think, would be really smart to do, but I don’t know if we’ll be able to do them. DUBNER: Was your idea for the West Virginia Energy Association met with open arms by the West Virginia coal industry? HENDRYX: Well, it was one I discussed more with colleagues and friends privately; I never approached them about it. DUBNER: Ah, so you too need to get out of your silo, though, perhaps, Professor Hendryx, right? HENDRYX: I do, you’re right, you’re right. I’m sure they would have welcomed the idea with open arms. DUBNER: Why are you no longer at West Virginia University? HENDRYX: Oh, that’s a pretty boring story, too. My wife is a professor, she’s an epidemiologist, and she was at West Virginia University, too, and she got a great job offer here at Indiana that was an important career advancement for her. So we moved here support her career. DUBNER: So your move from West Virginia wasn’t due to any kind of pressure — indirect or direct — against your research. HENDRYX: No. I’m sure that’s a quick question that comes to people’s minds. I’ve been asked about it a number of times. But it’s just not the case. It’s just a personal decision. DUBNER: Well, for those of us who appreciate academic research and freedom, whether from the individual level up to the provost/chancellor level, that’s very, very nice to hear, that you felt like the university really had your back, even though you were producing research that could have made things uncomfortable for them. HENDRYX: I’m sure it did make things uncomfortable for them in some other ways, and I’m sure there were a few of the administrators who were happy to see me go. But they did allow me to pursue my work, so I appreciate that. Chris DeFARIA: Suddenly visual effects budgets went from let’s say five percent of the budget up into the fifties and sixties. Bill WESTENHOFER: We had just received this Academy Award and I worked for a company that at that time was going through a bankruptcy. In a world where Hollywood movies are visually extravagant–why has the visual-effects industry in Hollywood vanished? Freakonomics Radio is produced by WNYC Studios and Dubner Productions. This episode was produced by Greg Rosalsky. Our staff also includes Shelley Lewis, Christopher Werth, Stephanie Tam, Merritt Jacob, Eliza Lambert, Alison Hockenberry, Emma Morgenstern, Harry Huggins, and Brian Gutierrez. Special thanks to the band The Company Stores, which we played in the episode. Check out their music at TheCompanyStores.com. You can subscribe to Freakonomics Radio on iTunes, Stitcher, or wherever you get your podcasts. You should also check out our archive, at Freakonomics.com, where you can stream or download every episode we’ve ever made – or read the transcripts, and look up the underlying research. You can also find us on Twitter, Facebook, or via e-mail at radio@freakonomics.com. Thanks for listening. Next Post »Is the American Dream Really Dead?